In an earlier post, I discussed the benefits of providing students with work days during class time for large projects. 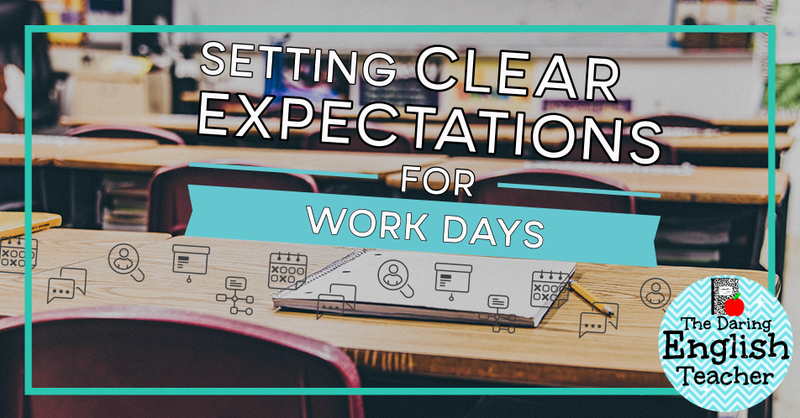 And while work days are tremendously beneficial for students, the lack of a formal lesson plan and structure can sometimes lead to classroom management problems. Whenever I designate a class period as a work day, I follow these simple guidelines to make sure that my work days are as productive as they can be. Students thrive on structure and order. When students know what is expected of them, they tend to perform better because they know what is and what is not acceptable. At the beginning of the workday, I set out clear guidelines and expectations. I also emphasize the importance of using the time wisely. Typically, I allow students to listen to music during work days. However, I inform them that texting and social media is off limits. 2. Make sure students have enough work to complete. One of the best recipes for success when it comes to planning a workday is having enough work for students to complete. It is even better if students have multiple assignments they can work on. With options comes choice, and with choice comes a preference. When students choose what to work on and when they have made that choice themselves, they are more likely to be productive in class. If a small percentage of your students are finished and idly passing the time, you are more likely to encounter classroom management issues. By scheduling a work day near the end of the grading period, students are more likely to see the fruits of their labor pay off sooner rather than later. 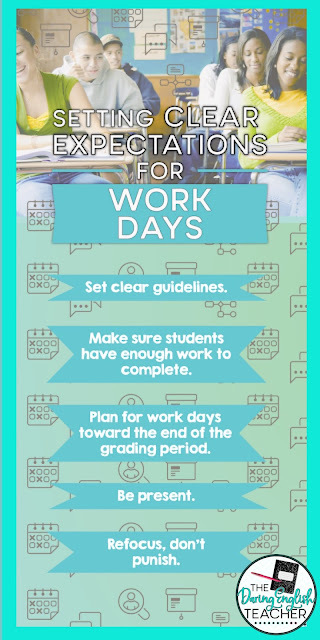 By knowing that not only will this assignment go into the grade book, but that it will also be entered rather soon and that it will have an immediate impact on their grades, students are more likely to work. One of the best times to schedule a work day is toward the end of the semester when students are overwhelmed with final projects and final papers. To make sure that students fully take advantage of the time you give them in class, you have to be present. This doesn’t mean walking around the classroom for the entire class period, but you should walk around periodically to make sure that everyone is on task. To be even more present as you walk around, talk with your students. Ask them questions about their work. Ask them what else they need to do for the assignment. Ask them to show you their progress. Ask them if they have any questions or if they need help. If students aren’t on-task during the work day, it is essential to focus your energy on refocusing the student rather than disciplining the student. An immediate jump to a punitive stance completely negates all of the benefits work days have to offer, and such an incident is also likely to distract surrounding students. Instead, try to refocus the students on the task at hand. I usually have to do this in my collaborative classes where I have quite a few students with IEPs. One of the best ways I’ve found to refocus a student is to give the student small, manageable tasks to complete during the class period. Once a student has completed a small portion of the task, praise is significant. However, rather than telling the student, “good job for getting this done,” recognize and praise what the student did well. Next time you plan a work day for your class, remember these five strategies to ensure that your workday is successful and productive.